Stanbic Bank was on Monday unveiled as the 2018 National Sevens Circuit sponsors in a renewable deal worth Kshs9 million. Each of the six host clubs will receive Kshs 1m each with the balance going into administrative costs. “Today we’re delighted to gather here to celebrate a sport that has put Kenya on the global map and has earned us huge fame and admiration from the rest of the world. Our continued investment is tied to a noble ambition to build rugby from the grassroots level of the game and encouraging even more people to watch and play the sport,” Charles said. 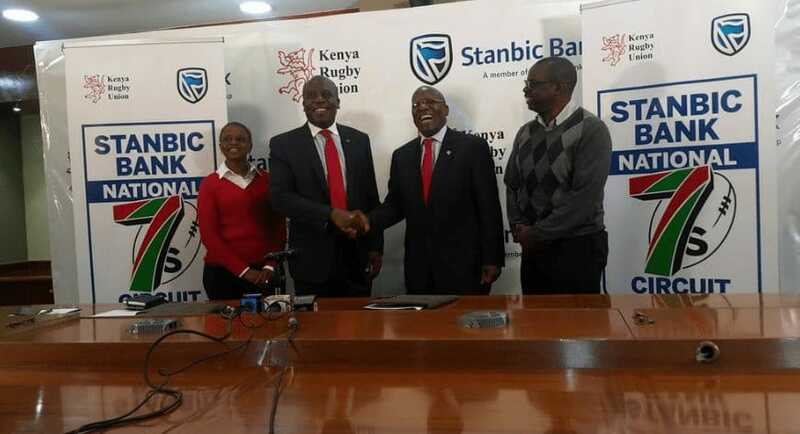 On his part, the Kenya Rugby Union boss Richard Omwela thanked Stanic for their continued commitment and support to the organization and the game. “The value of the sponsorship is Ksh 9m and will be channeled to the six host clubs on the National Sevens Circuit who will each receive Ksh 1m. It will also aid the Union’s administrative costs during the duration of the circuit,” Omwela said. The circuit is an annual series of rugby sevens tournaments run by the Kenya Rugby Union in conjunction with host clubs featuring teams from across the country. Teams compete for the National Sevens Circuit title by accumulating points based on their finishing position in each tournament. The season’s circuit, which kicks-off on July 21, currently comprises 6 tournaments in 6 cities and towns across Kenya.